Republicans narrowly maintained their majority in the Minnesota House in the 2004 election, squeaking through with a one-vote margin. Democrats picked up 13 seats, including five held by Republican committee chairs. The close headcount in the House could lead to more bipartisan cooperation... or greater gridlock. St. Paul, Minn. — If the election results hold, Republicans will control the House with 68 seats, the bare minimum needed to pass a bill. Democrats won 66 seats. An automatic recount will be held in one close race, which Republican Rep. Judy Soderstrom of Mora won by 94 votes **on the initial count. If the recount changes the outcome, the House would be split down the middle. DFL House Minority Leader Matt Entenza of St. Paul attributes the Democratic wins to a moderate agenda. "We campaigned on a very clear message. 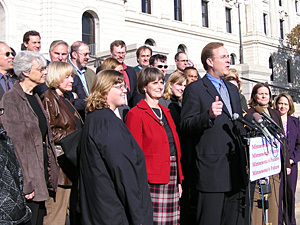 That Minnesota communities want their schools taken care of, they want to be able to get to work on their roads and with transit, they want to make sure they have a good decent job, and we need to take care of health care," Entenza said at a news conference on the Capitol steps on Wednesday. Entenza notes that Democrats picked up seats around the state, even in parts of Minnesota where President Bush did well, such as Rochester. Some of the Republicans who were defeated say their losses were less about the issues, and more the result of negative attack ads. Six-term Rep. Jim Rhodes of St. Louis Park, who is considered a moderate at the Capitol, says he was hammered by campaign literature attacking him. "That I was part of a Republican extreme agenda, that I didn't care about kids, that I didn't care about the city, that I should be fired," he recalled. Rhodes says he didn't sign a no-new-taxes pledge, and isn't opposed to either tax increases or expanded gambling. The Democrat who will replace Rhodes, Steve Simon, says he wasn't happy about the attack ads, which came from the DFL caucus, not from his campaign. But Simon says Rhodes should be held accountable for Republican budget cuts to schools and other programs. Republican House Speaker Steve Sviggum of Kenyon says he believes Republicans pushed a mainstream agenda in the last two years, but took the heat for not raising taxes to balance the budget. "We couldn't say 'yes' to everything, we had to reconcile the tax-spend difference, and politicians don't get elected by saying 'no,' politicians get elected by saying 'yes,'" said Sviggum. Sviggum also believes Republican incumbents were blamed for the partisan gridlock of the last legislative session, when work on virtually all major bills ground to a halt. He says House Republicans will reach out to Democrats in both the House and Senate to try to find common ground next session. Gov. Pawlenty extended a similar olive branch to Democrats. "It'll require us with a closer majority in the Minnesota House to make sure that we work in close concert with the House - Republicans and Democrats - and we're going to need to make sure that we have support, and probably in many cases, bipartisan support for our initiatives." But bipartisan support may be difficult to achieve, with the Legislature once again facing a budget deficit as high as a billion dollars. Pawlenty says he's sticking with his no-new-taxes stance, which Democrats argue has led to higher property taxes and cuts in services. Pawlenty also plans to pursue new gambling agreements with the state's Indian tribes that could bring the state a share of casino profits. That's an issue that doesn't appear to have much common ground with many Democrats, including Senate Majority Leader Dean Johnson of Willmar. "The governor went the additional step and said, 'one, I want $350 million, if you don't, we're going to do all kinds of bad things to you, and oh, by the way, I want to become known as the governor who brought casinos and the mob and all the things attached to it from Las Vegas because I can't get my way with the Indians,'" Johnson said. Johnson says the election results should send a strong message to the governor to review his agenda. He also notes that House Republicans' narrow margin means they can't pass a capital investment bill on their own. Bills that authorize borrowing by the state require a three-fifths majority. Johnson says he, too, will extend an olive branch to Republicans, by offering to meet with the new Senate minority leader Republicans will elect this week. But with all this talk about bipartisan cooperation at the Capitol, there's still not much evidence that Republicans and Democrats have moved any closer to agreeing on the major issues.